OCEAN CITY, MD.– The three counties that make up Legislative District 38 on the Lower Eastern Shore are a key battleground for the Republican drive to pick up five state Senate seats. Democratic leaders are fighting hard to protect incumbent Jim Mathias, the only Senate Democrat with a majority of registered Republicans in his district. The district runs from crab shacks on the Chesapeake Bay in Somerset County, one of Maryland’s poorest, to the million-dollar condos and homes on the Atlantic Ocean, with lots of chicken farms and poultry processing plants in between. The battle lines were sharply drawn this past week with Democratic Senate President Mike Miller, House Speaker Michael Busch and other top Dems boosting Mathias, 66, at a Ropewalk Restaurant fundraiser on Assawoman Bay. Gov. Larry Hogan and Senate GOP leaders are behind Del. Mary Beth Carozza, 56. Carozza and Mathias were unopposed in their June primaries, but Carozza got 2,000 more votes than Mathias with a higher Republican turnout. Mathias, who was first elected in 2006 to the delegate seat Carozza now holds, said the district has been trending Republican and there were down-ballot races that brought out more primary GOP voters. Mathias has more than twice as much money in his campaign fund as Carozza, $244,000 to $110,000. 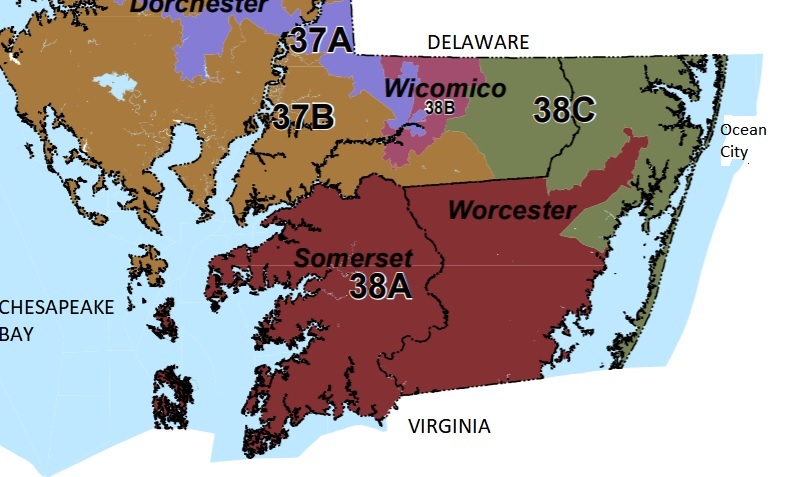 Legislative District 38 with three single-member delegate districts, all represented by Republicans. Transplanted from Baltimore, deep ties to O.C. Both are transplanted Baltimoreans with strong roots in the Ocean City they moved to years ago. Mathias was the mayor of Ocean City for 10 years, 1996-2006, and Carozza worked in her family’s fast food business. With the retirement and defeat of several Senate Democrats, Mathias would be one of the last surviving even moderately conservative Democrats left in the Maryland Senate. “The shore is a very conservative area,” Mathias said in an interview. But he emphasized that he and Republican Gov. Larry Hogan have been “working together.” For instance, Mathias was an original advocate of starting school after Labor Day to help business in Ocean City and the families who wanted to vacation there. Hogan eventually decreed the move statewide by executive order. The governor’s battle with cancer in 2015 is also “a bond that he and I have,” Mathias said. His wife Kathleen died of cancer seven years ago, and he has been active in anti-cancer efforts. At a campaign fundraiser Friday, Senate President Mike Miller emphasized how Mathias has been a strong advocate for his constituents, such as the poultry industry. U.S. Sen. Ben Cardin, running for re-election himself, stressed Mathias’s work in Congress to keep funding for dredging of Ocean City’s harbor and other issues that impact the shore. 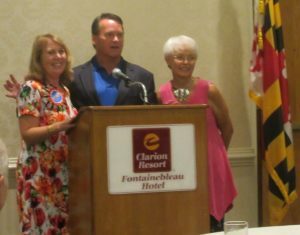 Carozza stresses her strong ties to Hogan, who is extremely popular on the Eastern Shore, which she said felt neglected in the O’Malley administration. The Republicans “Drive for Five” is geared to bringing the Senate GOP contingent up to 19 members. That would be enough to sustain vetoes by Hogan, but Senate Minority Whip Steve Hershey also points out it would be enough votes under current rules to maintain a filibuster and block bad bilsl. Carozza emphasizes another outcome of greater Republican representation. “It means that you have to work on issues in the very beginning with the other side. You can’t just say well we’re going to do what we want because we had the votes not only to pass it but to override you. Once we can sustain that veto it forces everybody to come together on the early end and that’s better for Maryland and we know that’s better for the shore. 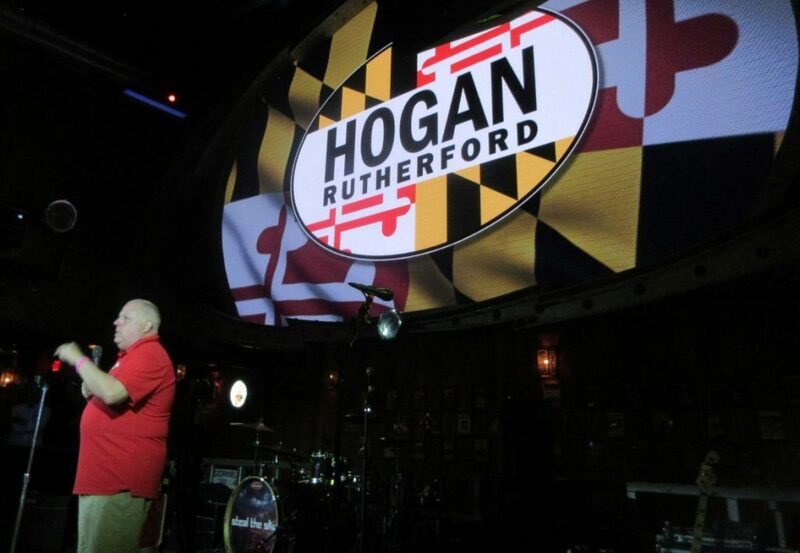 Hogan is getting concerned about complacency as people read he is ahead in the polls. “Some people are starting to get overconfident,” he told a large and boisterous crowd at Seacrets nightclub here Friday night. He was introduced and endorsed by Rick Meehan, the current mayor of Ocean City who succeeded Mathias.